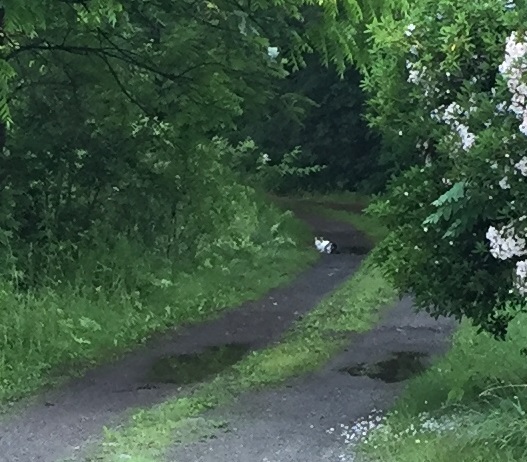 Recently a long-haired white cat with a black-and-white bustle tail showed up in our neighborhood. We know not whence this bedraggled beauty arrived but s/he is here wandering and bustling about. 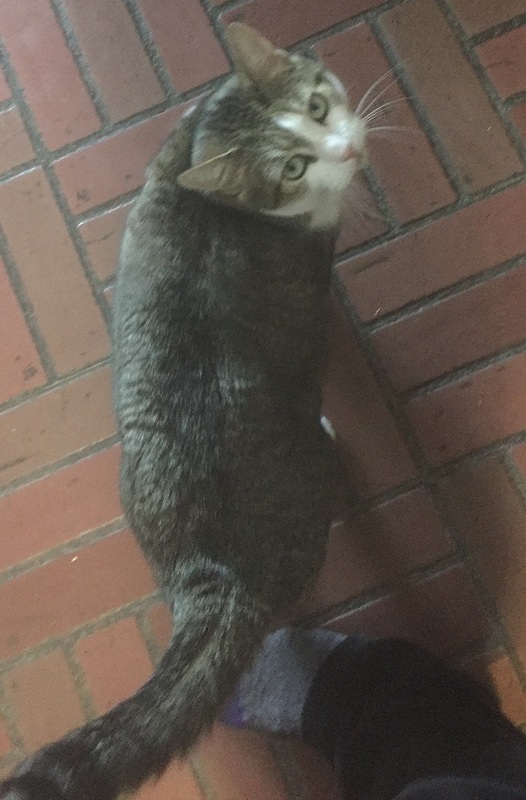 I have spoken with several neighbors and no one seems to know if this cat has lost his or her human or if s/he is a drop off. My friend and neighbor Lisa named the stray Bustle because the cat’s tail does look quite poofy. I feel in a bit of a fix. I have two indoor cats who would not be happy with me befriending this outdoor interloper and allowing this feline to strut about outside while they are not allowed to participate in outdoor adventures. I remind my fur-babies that I don’t want to deal with fleas and ticks in the house or on them and their job is keeping the mice at bay in the house and not to pilfer the local wildlife population. This stray is quite skittish. Do I make an attempt to befriend, catch, and bring to a shelter? I feed songbirds and chipmunks. It would be unfair to make my wild neighbors easy meals for this feral cat. And just how feral is this feline? Has the cat been abandoned? Lost? I haven’t seen any flyers up in the area. Meanwhile, whether lost or feral, most cats are stealthy and successful hunters and my chippy friends are nervous and the baby rabbits stay hidden – no longer frolicking in the yard. Though you may look perplexed as you watch your puss lap up the remnants of spicy tomato sauce (Bree), or find out it was your feline eating the asparagus off your plate (Cloe), or act alarmed when you have to shoo your cat away from eating a plastic bag she found (Madeline tells me, “But, Mama, it’s essence of dinosaurs.”*), you may wonder if your cats are indeed carnivores. They are. They need meat to survive. Whether wet canned or dry bagged – cat food is comprised mainly of meat, though some brands do have unnecessary fillers. 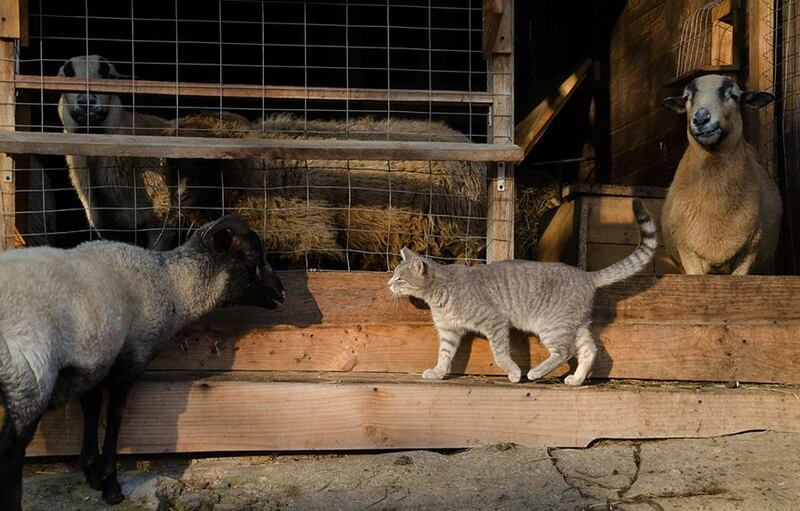 Where there is a farm, chances are there is at least one barn cat. Cats are useful companions on farms because, whether they are skittish of humans or not, their job is to catch and eat rodents – they are the best, least expensive, non-toxic pest exterminators. Additionally, cats eat bugs: flies, crickets, grasshoppers, moths, and beetles – whatever they can catch. And they appear to have fun doing their job. 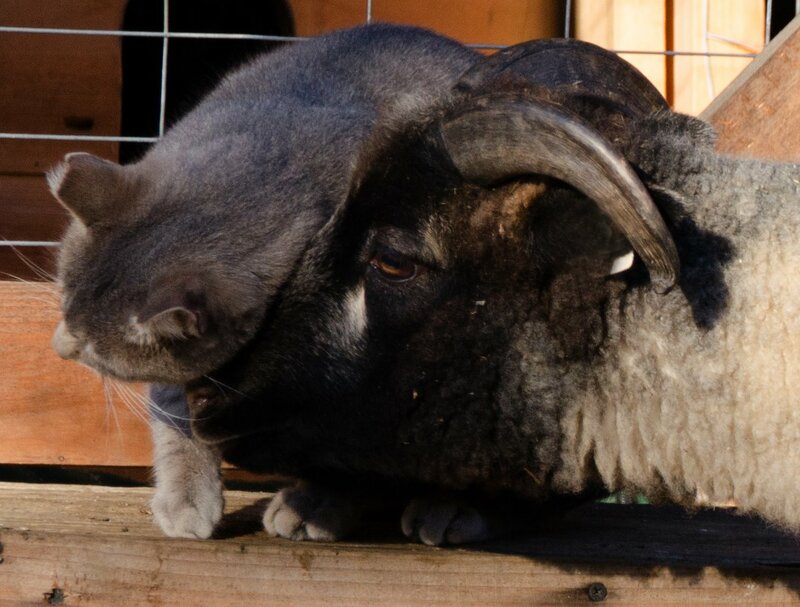 Barn cats also befriend the other barn animals; keeping one another company on those long cold nights. It is true that cats do a terrific job at keeping the mice and rat population down. But is that all they are catching? If your cat is an outdoor cat, your feline probably brings you “presents”: mice, voles, moles, birds, and bats. These demonstrations of successful hunting contribute to the mortality of songbirds and small mammals. Researchers estimate “one pet cat kills between one and 34 birds a year, while a feral cat kills between 23 and 46 birds a year…killing 1.4 billion to 3.7 billion birds each year. (Loss-et-al.-2013)” And apparently the mammalian toll is even higher: “ranging from 6.9 billion to 20.7 billion annually” concluded researchers from the Smithsonian Conservation Biology Institute and the U.S. Fish and Wildlife Service. And if that wasn’t enough, their feces can harbor a toxin as well: Toxoplasma gondii. “T. gondii is a parasitic protozoan that can infect all warm-blooded species but relies on felids to complete its life cycle. Cats that host T. gondii excrete oocysts into the environment in their feces, and a single cat can deposit hundreds of millions of oocysts, which may remain infectious for up to 18 months (Tenter et al. 2000).” Eek! Makes me wonder if I am doing any good by using pine pellet litter and keeping it out of the waste stream by composting it. Not in the food compost pile, mind you, but a leaf litter and vegetation debris pile. Still, toxoplasmosis has some curious effects on humans and in mice it will actually inhibit the fear of cats, whereby mice make themselves easier prey and the cycle can begin again in the cat after mouse consumption. Going back to Bustle, our wayward beauty: This cat does appear somewhat lost. Heading up and down the road, as if trying to get his or her bearing on the landscape. Now, a cat is not considered wildlife so it may not fall under the law that prohibits the relocation of wildlife. Still, it is unwise to move wildlife or cats because the moved animal may compete with animals already in the vicinity, disrupt the ecological balance, or be killed while attempting to get back home. Wherever Bustle belongs I hope s/he finds home safely. 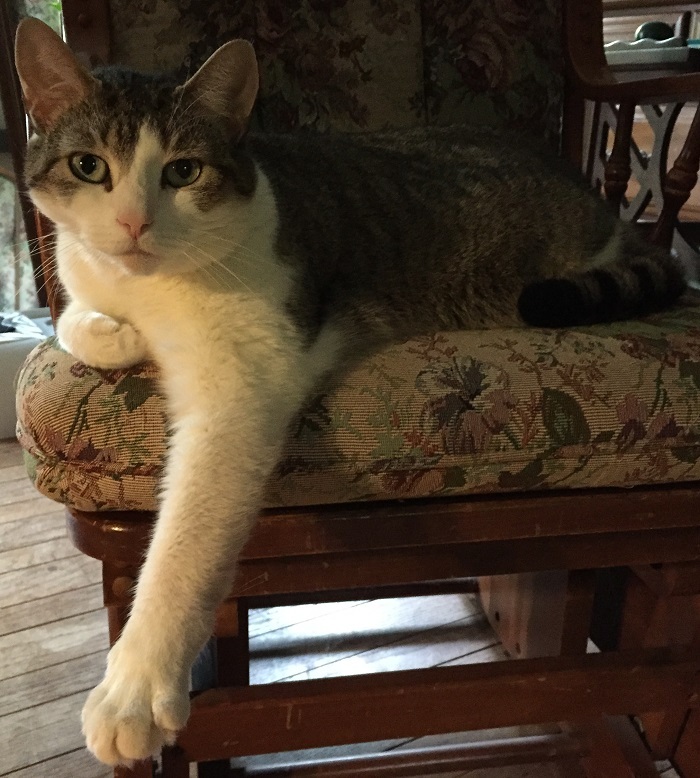 And if Bustle fits the description of your missing kitty (and you live in Ashfield, MA), please contact me. Into the Outside is a bi-monthly feature in the Ashfield News. This article (edited for space) appears in the July 2018 edition of The Ashfield News. Madeline: But, Mama, I am a predator. Me: Dinosaurs are too big for a cat to eat. Me: Madeline, those are bags. They aren’t living beings that you chase after. Madeline: They move if I bat at them. Me: I’m still taking this plastic away from you. Madeline: you’re no fun. You let my sister play with feathers. Me: They’re feathers. And Bree doesn’t eat them. Me: Madeline, here play with this feather. Madeline: I don’t want to. I want the dinosaur. Me: This bag is not a dinosaur. Madeline: It’s the essence of dinosaur. 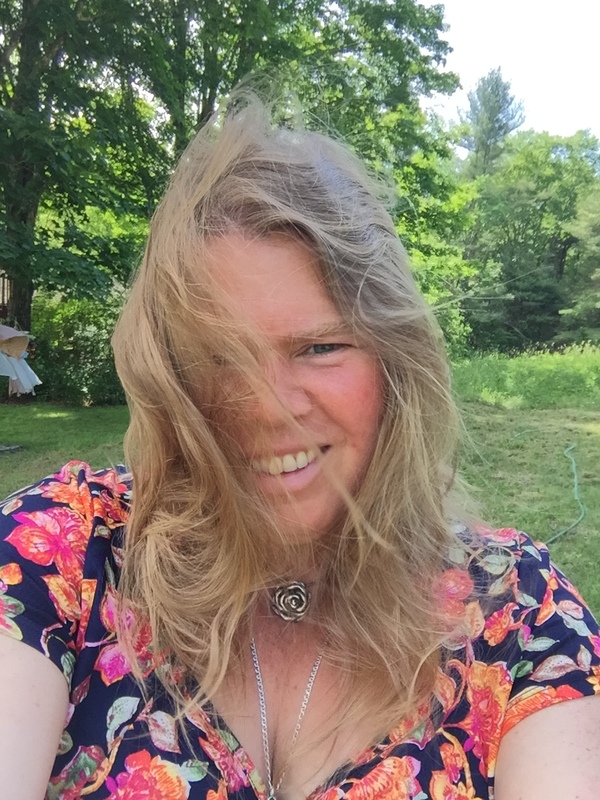 This entry was posted in Natural History and tagged Arianna Alexsandra Collins, Barn Cats, Bustle, Cats, Feral Cats, Hearken to Avalon, Into the Outside, Stray Cats. Bookmark the permalink.